My friend Clarence (from Streetfilms) has just returned from the 7th Annual Village Building Convergence in Portland, Oregon. 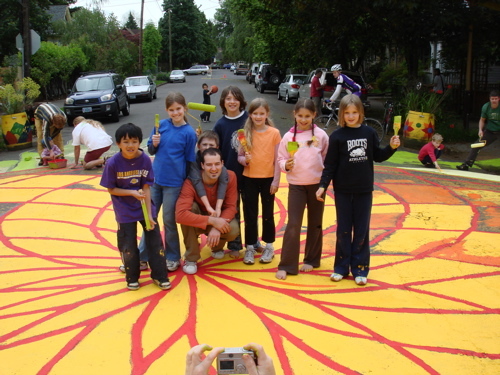 This is a 10-day-long event where “neighborhoods activate to build shared public places that they have envisioned, designed, funded, and will maintain for themselves”. One of my (and Clarence’s) favorite projects is the homemade traffic circles that are not only cool works of public art but also help to calm traffic at residential intersections. Although there is no actual 3-D structure, the painted designs actually DO cause drivers to slow down… maybe so they can admire the artwork! Anyway, more photos and reporting (plus a film later this week) can be seen here. Wouldn’t it be great to do this in Brooklyn?? BIG Native Planting Day, June 4th!